Mickey Mouse has a big date with Minnie Mouse (relation?) 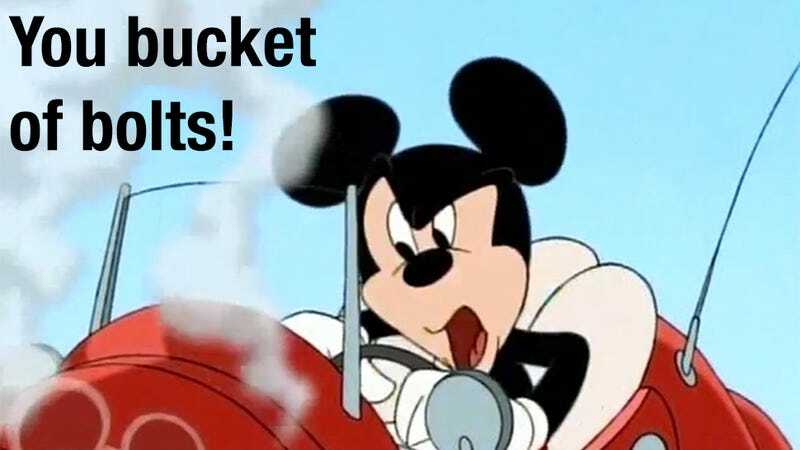 but on his way to get Minnie he realizes his “bucket of bolts” is just an "old jalopy” and isn’t the kind of car suited to pick up Minnie (golddigger?). I’ve owned a few not-so-nice cars (i.e. 1986 Sunbird SE) and dated a few nice looking ladies. I’ve done stupid things to impress said ladies, but not once did I ever think – “Oh, I should trade in my car for this girl.” That’s dumb and was Mickey’s first mistake. A radio ad comes on just as the engine spits oil all over Mickey’s shoe. The announcer convinces Mickey it’s time to replace his jalopy. Given the color and viscosity of the oil that spewed from Mickey’s engine, it’s a wonder it was running at all. Maybe Mickey should date less and mechanic more. Mickey marches into the dealership with a stern take-no-prisoners look on his face. He isn’t going to let a small thing like sensibleness deter him; come hell or high water this mouse is leaving this dealership with a new car. By golly. Right away one thing is clear - this cartoon isn’t remotely based on real life. How's that you ask? Mickey goes from trade-in to out-the-door in less than one-minute. Anyone who has purchased a car, especially when a trade-in was involved, can tell you it takes at least half a day. I asume in Toontown small things like paperwork, money and contracts don't exist. Mickey’s new red sports car looks like a mix between the Batmobile (Batman Returns), a Deville Panther and a vector-based car I’d create on Illustrator. As Mickey approaches the driver’s door, it slides open automatically via some pneumatic-like system. It ones-ups Ford's use-your-foot-to-open-the-boot feature. Once in the car Mickey gets into the throttle, hard. The car tears off, leaving behind a trail of smoke and echoes reminiscent of a race-trimmed V8. Like most new car buyers, Mickey takes off without learning anything about the features his car has to offer or how they work. While traveling at roughly 87 mph (I made that up) Mickey begins haphazardly pushing buttons and a myriad of distracting things start to happen. The first button Mickey pushes is for the car's surround sound. Similar to Audi A8's speakers that rise from the dash, multiple instruments (drums, saxophone, brass horn) extend towards Mickey's head and provide the most surrounding of surround sounds. Mickey also struggles with the climate control and the one-touch hardtop convertible release; neither of which he manages to master, even though they are large hard buttons and not controlled via an overly complicated touchscreen interface. Mickey’s car appears to have the most predictive navigation system in the world. Either that or the person who drove the car last also went to Minnie’s house (golddigger and a tramp?). Mickey pushes just THREE BUTTONS and the screen immediately displays MINNIE’S HOUSE. Then Mickey decides to engage a large (likely LED lit) glowing red button that says SNAPPY. I believe SNAPPY stands for Self-Navigating Auto Pilot Preference YOLO. Once the SNAPPY button is pressed the car applies a rudimentary navigation logic; the fastest point between two places is a direct line. The car takes off, burying Mickey’s head deep into the headrest, with a horizontal acceleration of 6.3 g (estimated). SNAPPY thrusts Mickey through, under, inside and over any obstacle in its path at a speed that can only be described as cartoonish. Minnie’s house, and Mickey’s big date, are only a few minutes away. Then, disaster strikes. After piloting a tunnel upside down wearing automatic night vision goggles, a LOW FUEL light flashes and Mickey’s car will not start. As Mickey goes to the rear of the car to access the gas door he finds instead a 50ft 110volt cord. He plugs the car in after hunting for a random plug along the wall of the gas station...something I'm sure a few LEAF drivers have done in more rural locations in the US. Once fully charged (3 seconds, Elon. Fully charged in THREE SECONDS) the car, left in DRIVE, takes off; dragging Mickey with it. If Toontown had a NHTSA-like regulatory organization Mickey’s car would have had the proper safety mechanism to prevent this from happening. It gets even worse. Once Mickey is able to get back behind the wheel, the car refuses to respond to driver inputs. The car has gone into snappY mode (emphasis on the YOLO). The car drives off a pier, into a lake, turns into a submarine, then a jet, flies up a mountain and kicks Mickey out once on dry land and back into car-mode. Mickey, angry as Mickey Mouse can be, pounds on the window demanding the car let him in. The car, which at this point we should call Christine, flashes on the infotainment screen in Atari-style font AUTO DRIVER. The car revs its engine (more V8 sounds and smoke) then takes off, leaving Mickey alone and emotionally wounded. Head hung in shame Mickey goes back to the dealer to try and undo his deal and get his jalopy back. Only problem – his car is no longer there. He walks away, miserable, hating life, himself and technology. Just as Mickey thinks the world is ending, Minnie pulls up…in Mickey’s old car. This is a lot like that Chevy commercial where the old guy is reunited with his Chevy after years of being apart. The cartoon doesn’t say why or how Minnie knew Mickey’s car was traded in. Nor does Disney share with us why Minnie was out car shopping while supposedly waiting for Mickey to pick her up. Old cars, when cared for, are (still) worth owning. In Toontown electric cars charge very fast and sound like V8s. For the record, I think it's weird, even if well-explained, that Mickey and Minnie are just dating yet have the same last name.